Cai Xiaoru, Forbes listed young billionaire of mainland China, has signed the partnership agreement and committed to invest $ 30 million into SriLankan satellite company SupremeSAT through his Shenzhen listed company Tatwah Smartech. The agreement signing was concluded in Colombo, paving the way for Sri Lanka’s only satellite company to go global using the expertise and resources of the new-found investment. The partnership with TatwahSmartec and the visiting young billionaire is set to boost SupremeSAT’s capabilities and resources further in a big way, making Sri Lanka proud in the global space arena. “Tatwah is evolving as a globally strong player in the satellite communications industry. I am very pleased to see the remarkable growth SupremeSAT has achieved within a very short span of time, competing against many strong global brands. 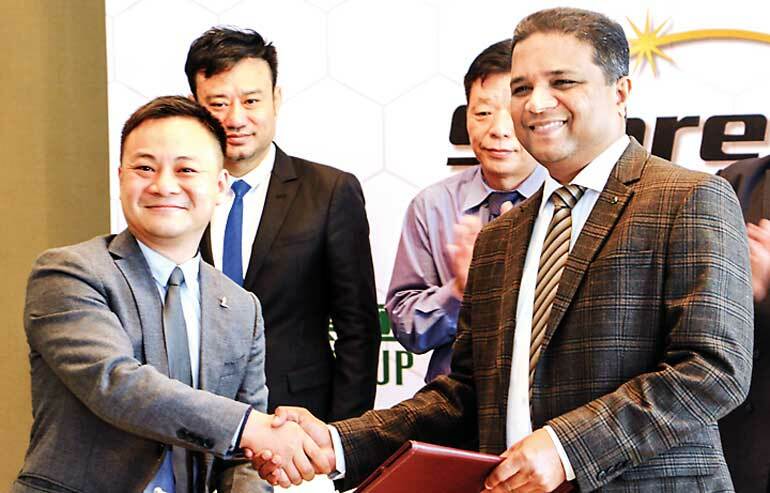 I am confident that this partnership will bring more value of Tatwah’s resources, and redefine the capabilities of SupremeSAT to further grow in all areas of its operations,” saidTatwah Smartech Co. Ltd. Chairman XiaoruCai. “As a private company hailing from a small island nation, SupremeSAT has proven to the world that the company has become a formidable player in the global space industry. Having established the long-term strategies and infrastructure to expand the company’s business we expect to accelerate our growth by way of selected acquisitions worldwide,” Supreme Global Holdings Chairman R.M. Manivannan said. “Five years ago we vowed to take Sri Lanka to the next level of technology and we have walked the talk. Our concentration was on making Sri Lanka a formidable player in the global space industry and today we are taking another giant step towards that,” he added. The new strategic partnership will focus on growing SupremeSAT’s existing activities in Sri Lanka whilst also concentrating on large-scale expansion globally with the combination of synergies. The SupremeSAT-3 Capacity created by SupremeSAT in partnership with Intelsat SA has given the company a long-term contract with Sri Lanka’s Dialog TV thus providing over 90% the local market share. The company is hence concentrating on growth globally for further expansion. SupremeSAT’sPallakele satellite control centre is also called “South Asia Space Academy” and the company has invested heavily on space-related research, development and training. Many young Sri Lankan scientists are working tirelessly dayand nightto make Kandy the knowledge hubof Sri Lanka. Having gained the space business expertise with the launch of SupremeSAT-1, the company further expanded aggressively creating the SupremeSAT-3 capacity and also completing the construction of its state-of-the-art teleport in Pallakele. SupremeSAT has now secured many globally-reputed companies as its long-term customers, making Sri Lanka a formidable player in the satellite industry. The company is steadily progressing on many innovative initiatives including the building of Sri Lanka’s first humanoid robot named “Shakthe,” building of small satellites within its newly-built ‘Clean Room,’ etc. Existing activities of the company are supported by many global companies. Japan’s NEC and Sweden’s Swedish Space Corporation are already cooperating with SupremeSAT’s ground control activities. The satellite control centre functions in partnership with an US company whilst satellite manufacturing is supported by aEuropean company. The latest inclusion of the Chinese listed company further strengthens the company’s global reach. ZhongshanTatwahSmartech Group Co.,Ltd. (Tatwah Group) was founded in 1993 and listed in Shenzhen Stock Exchange in December2010. In the belief of ‘Leading the bright future by creating applications of values,’ Tatwah Group has diversified its business into four innovative industries: Satellite and telecom, Internet of Things, smart city, OTT+TV, E-finance. Tatwah Group has established more than 20 subsidiaries till 2017 which makes its market value exceed RMB 20 billion.